Its nice to have a connection. It's both placid and has good reflection. Apollo knows what I am saying. Midnighter is just preying. Whilst Jenny is standing to attention. Unlike new Writer: Peter Milligan; Artist: Miguel Sepulveda; and Publisher: DC Comics in April 2012. Though I could be wrong you know. In the 'Da Vinci Code', our stormy bunch of watcher's are presented with two threats with a tale to tell. Kind of like a dating show with some occasional violence. Well, after she receives warning from the ships monitors, The Engineer splits her team into two, and instructs them to both go to two different locations, to pick up two very different people. Violent people. Jenny, Jack, and J'onn, zip off to Rome, Italy, and get their hand's on some love-struck nut-job who was once a member of an earlier incarnation of their team. Piero Rosci is his name, and his game is revenge upon his one time masters, 'The Dark Lord'. 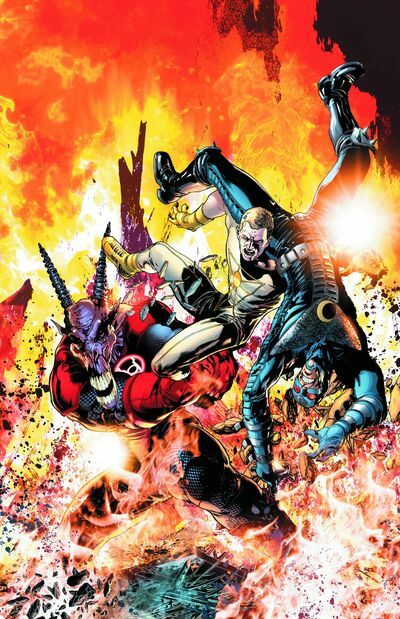 Meanwhile, Apollo and Midnighter fly to Devon, England, and get into a skirmish with a goat-faced Red-Lantern, who just wants to burn everything in his path. No. Not happening. Once the captured and the liberated are all back at Stormwatch HQ, two finite solutions present themselves whilst another more stranger question is posed. There were two pieces of dialogue that floated my boat in this tale. The first one was when Jack said to the City of Rome whilst rebuilding her 'Rome was not built in the day. Sorry. I could not resist that', because I could sympathise with his comment. Nice opening remarks. And sums up what this issue is all about really. Although this issue is one divisible by two, and has a synchronistic way about what it's trying to accomplish with each strand. Aesthetically the underlining message that this tale is trying to convey is what makes a true hero. Someone who is bold? Someone who is willing to do what other people aren't? Or is it something else entirely? I found that this was subliminally encapsulated in the book-end 'Midnighter sequences' very well, and was quite original too. The Red Lantern part of the tale felt too much like a titivation that never went anywhere really. OK. I know that I could be wrong in the future. But as of this telling, it came across more like a blatant Red-Lantern cameo. STORY: Including the subliminal message I stated previously, I enjoyed the Da Vinci / Vatican part of this yarn. Plus that open-handed hologram battle between Batman and Midnighter which faded before it could begin. Tease. ART: Miguel Sepulveda is one top class artist. I like the way that Piero Rosci started to hover when he went nuts. In addition to this, I have taken a shine to the overall cinematic feel and tone to the layout as well. Very grand. PIERO ROSCI: Rodrigo Santoro from the epic Greek war-time action adventure '300', looks like a man that would do anything for the woman he loves. Well, he did so in British rom-com, 'Love Actually', right? Plus he was 'stupping' J-Lo. RED LANTERN: Rodrigo's '300' co-star, Andrew Pleavin, looks like a goat already. Therefore, it would not take too much make-up to turn him into this very angry Lantern. Love May Be Blind. But Heroism Needs Contact Lenses. So this tale was about emotion, right? Anger and love. Captured by a stellar force from beyond the stars. Well, it is very simple what this could be in musical form, huh? David Bowies 'Space Oddity '. Though I am not to sure who Major Tom is! Maybe J'onn? YES! Peter Milligan is in the house! And with him he has brought his own personal tale mixed in with a galactic adventure. I knew that Pete would not disappoint me. He is one of those writers that make a book so much his own, that when he leaves it, he leaves a dent behind. Great start. Looking forward to the future.